We are excited to be part of a growing, vibrant downtown. 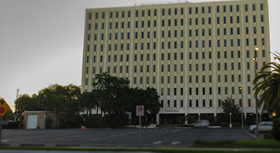 We understand, though, that because of multiple concurrent events at the Straz Center, and in surrounding areas, this can result in a very high volume of traffic and potential delays. New spaces are coming soon on the bottom levels of several of the new properties going up around the Straz, and we thank you in advance for your patience. The Straz Center has put together some commuting and parking options to help smooth your journey into Downtown Tampa. We recommend using Google Maps, Waze or a similar traffic/GPS app when planning your arrival to any of the parking areas. We also recommend arriving in Downtown Tampa at least 90 minutes before your scheduled curtain. Arriving early to Downtown Tampa will not only give you the chance to snag a good parking spot, but also the opportunity to explore. You can discover a new pub, take a stroll on the Riverwalk, or try out a restaurant you’ve never tried before. It may become your new favorite. 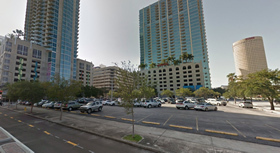 Three pre-paid locations are now available in downtown Tampa: Rivergate Tower, Royal Regional Lot and Poe Garage. While you will not see Jobsite’s show names when you search (this is a contract-based service we are working on), you simply need to find another event happening at the same time as ours. If you see, for instance, a Broadway show, a show in the Jaeb, a concert or comedy show or the orchestra with a similar curtain time as ours go ahed and buy it! They are not checking tickets and have been told this is a-ok for us to communicate with our customers. 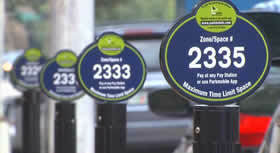 See if pre-paid parking is available for your event*. Of the 900+ parking spaces available in the Poe Garage, 160 are available for purchase in advance. Scanning will begin at noon for matinees and at 6 p.m. for evening events. Guests must also arrive no later than 45 minutes prior to the start time of their event to have their permits scanned. Our pre-paid reserved spots at Rivergate Tower and Royal Regional Lot are very affordable spaces with easy entry and exit that you can pay for through the website. So, all you have to do is pre-pay, arrive, then take a short, six-minute stroll to the Straz Center for your show. *This is a third-party site run by Parkmobile. When logging in, please create or use your existing Parkmobile login, or check out as a Parkmobile guest. Space is limited and parking is on a first-come, first-served basis. We recommend an early arrival. Rates vary but the current rate for major events at The Straz won’t exceed $6. This lot opens two hours before most major Straz Center events and charges a flat fee of $10. Space is limited. $10 per vehicle, cash only, or pre-purchase. This lot is open to the public after 5 p.m. Monday-Friday and 24 hours a day on Saturday and Sunday for a flat rate of $10. 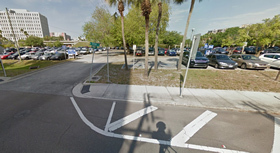 Street parking using Pay Stations or the Parkmobile app is available on many of the streets surrounding the Straz Center, including near Water Works Park. The meters are free weekdays after 6 p.m. and on weekends. Arrive after 6 p.m. on weekdays. Park any time on weekends. This lot is an approx. 6-minute walk to The Straz and charges $2 a day except during special events when the rate increases. 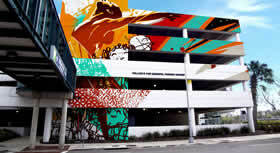 There are approximately 500-600 parking spaces available and the garage is roughly a 15-minute walk from the Straz Center. 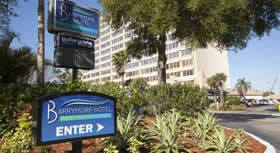 You can walk down Ashley Drive or take a more leisurely stroll down the Riverwalk to the Straz Center. Wear your walking shoes and see everything downtown has to offer. Leave your car at home or park remotely. A free, green ride service, vehicles operate seven days a week in Tampa’s downtown business district, which includes the Channel District, River Arts District, UT and the non-gated north end of Harbour Island. Park remotely and hail a vehicle. Rides can also be requested through the app. This free service stops every 12-15 minutes at certain public parking locations, hotels and points of interest in Downtown Tampa. 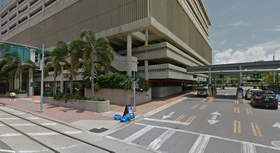 The stop at Cass/Tampa Street is a five minute walk from the Straz Center. Hours vary and service is available Mon.-Sat. 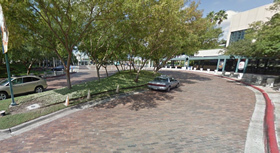 Park remotely and take the Pirate Water Taxi to the Straz Center. It stops seven days a week at fixed locations along the Tampa Riverwalk. Perfect for guests who want to avoid parking issues and/or enjoy an adult beverage or two at the show. For guests coming from St. Pete to see a Sunday matinee, this ferry service operates between the St. Pete downtown waterfront and the Tampa Riverwalk.